Ricky Ricotta lives with his Mum and Dad in Squeakyville. His biggest wish is for a friend, a big one, who will help him thwart the bullies who pick on him. So one day, when evil Dr Stinky McNasty brings his Mighty Robot to town, Ricky befriends the giant robot. Instead of destroying Squeakyville, Mighty Robot teams up with Ricky to destroy evil and they become heroes and close friends. 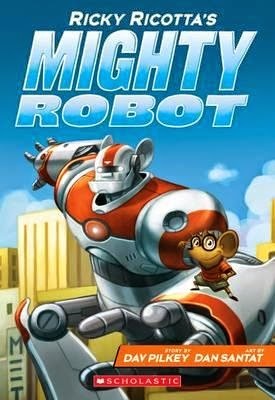 Ricky Ricotta's Mighty Robot is another series by the author of Captain Underpants which is well loved by primary aged boys everywhere. Together with illustrator Dan Santat, Pilkey has created a colourful, glossy book, full of fun illustrations, cartoon strips, boy humour, evilness, alien monsters and flip-o-rama's, that will also appeal to the young Captain Underpants fans. A thin volume with very short chapters, short sentences, easy words, craziness and lots of action, Ricky Ricotta will attract beginning and reluctant readers as well as those who just want a fun fast read.